Ray conducts a page-through of "matching" copies of Electric Fire from the Clouds, a concept book about Benjamin Franklin's historic electrical experiment with a kite. He explains how the text is arranged to be sympathetic to the unique "ink pull" image appearing on each page. Lead Graffiti enjoys wide-ranging connections to a variety of people and organizations through social media and workshop offerings to student and professional designers and writers, and through our links with the University of Delaware and the American Printing History Association. 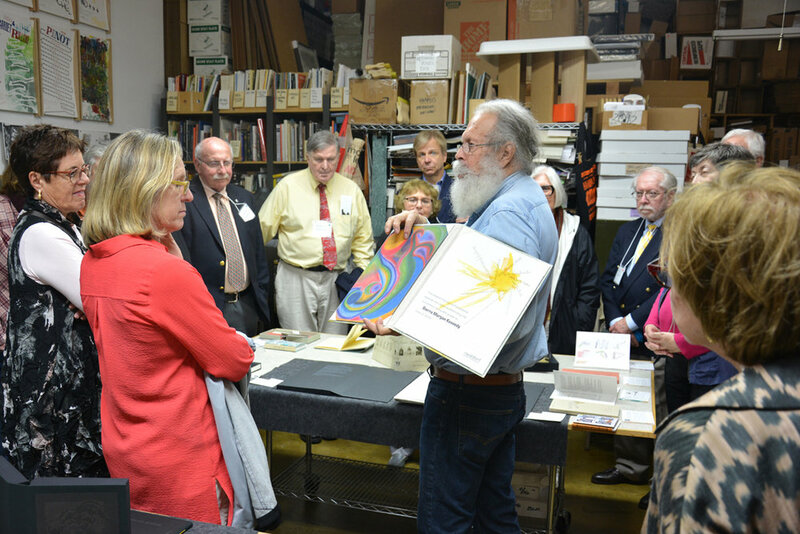 Today, our connection to the U of DE and the Delaware Bibliophiles added a new relationship to FABS. The Fellowship for American Bibliographic Societies (FABS} is holding their annual conference at the University this weekend. Today brought a lively group to Lead Graffiti to talk books and breathe some creative and rarified bookmaking air. Emphasizing our interest in experimentation with the standard set of operating rules, we introduced Lead Graffiti as a "letterpress lab of sorts," which received a noticeable laugh to start things off. Typically, we show visitors a range of our commercial letterpress samples and personal work. Today as a deliberate point of departure, we displayed only books. Discussion was aimed at a very knowledgeable audience of book lovers and collectors, making the day agreeably different and especially enjoyable. Here is a listing of the items we had on our tables for perusal. Moments Carved in Paper #1 : The Librarian Made Us Do it! Moments Carved in Paper #2 : EifleS! Leonard Baskin : Art from the Gift of Alfred Appel, Jr. Here are a few photos from the gathering. Digressing from bound pages, Ray points out the display of our favorite posters from Lead Graffiti's Tour de Lead Graffiti broadside series, which typographically captures each stage of the Tour de France cycling action from 2011 - 2015. Referring to the "citizen band" of townsfolk marching across each spread, Ray describes our involvement as designers and photographers for the 300-page Histories of Newark : 1758 - 2008. 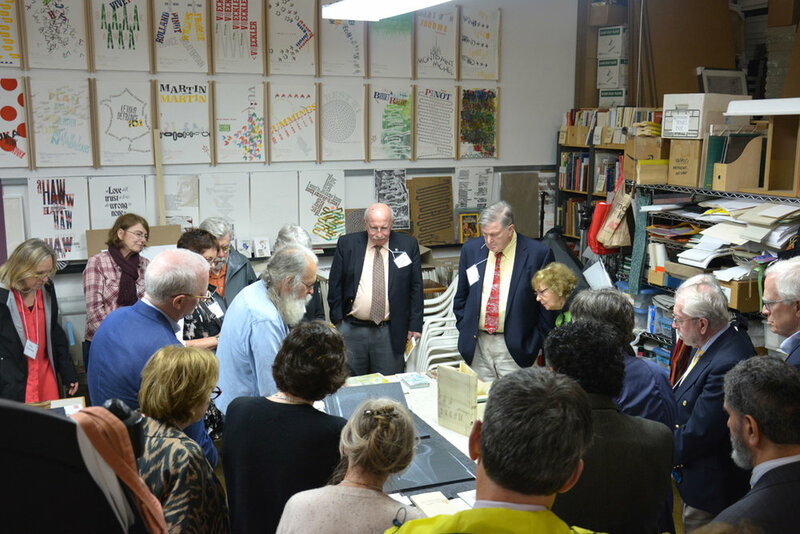 Mark Samuels Lasner (with red handkerchief), a long time supporter and patron of Lead Graffiti's letterpress efforts, was the coordinator of this year's FABS conference and included our studio on the agenda. 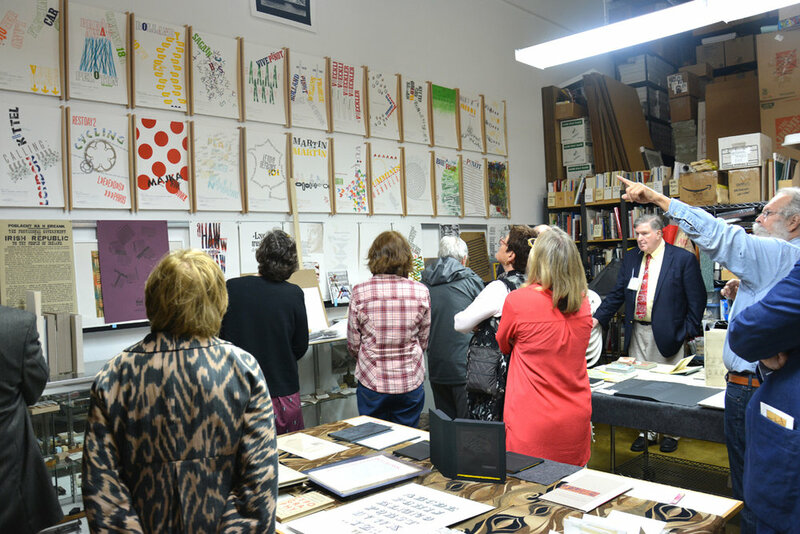 Showing the results of our favorite collaboration with the eighth-grade students of the Waldorf School of Philadelphia, Ray explains the creative process of producing the diplomas. Lead Graffiti has been working with each graduating class since 2013. Michael Thompson, of the Caxton Club and chair of FABS, gives Ray a light grilling during some question-and-answer conversation with the amused crowd. This original and unbound Genesis 1 : 1 folio sheet from the Doves Press Bible is a favorite item in the Lead Graffiti collection and a treasured 60th-birthday present to Ray from his university students. This says something both about Ray and the nature of his students. Several attendees purchased books and it appears that we might get 1 or 2 commissions that sound most interesting. All in all a FABS-ulous day at Lead Graffiti.